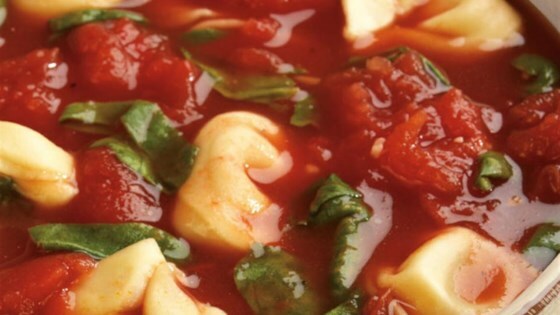 "Red Gold® Fresh Squeezed Tomato Juice and Whole Peeled Tomatoes are what give this soup its tomato goodness. Spinach and cheesy tortellini make it a meal. So easy to prepare, a delicious meatless dish." In a soup kettle combine the beef broth, to the tomato juice and juice from tomatoes. Tear tomatoes with fingers to create large chunks and add to broth. Add thawed spinach, tortellini, garlic and black pepper. Cook for 35 minutes to blend flavors. Sprinkle with Parmesan cheese before serving. I used 4 cans of tomato soup instead of tomato juice. 2 cups chicken broth instead of beef broth. It was a winner with my loving husband........just gives me more to try! I would definitely make this soup again, it is very good. I made no changes, it makes a lot of soup it's great for lent, no meat. I sautéed some zucchini and added it to the soup. Also used diced toms instead of whole. This makes A LOT of soup!